With a quarter of my heritage being Irish, I feel uniquely qualified to announce tomorrow’s St. Patrick’s Day promotion. 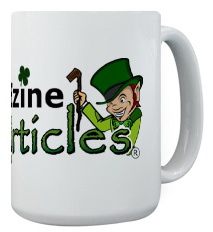 The rules are simple: The top (17) authors based on the highest number of qualified article submissions between midnight and midnight CDT on St. Patrick’s Day (March 17th) will each receive one of these fine limited-edition EzineArticles Leprechaun mugs which we’ll ship to any confirmed postal address around the world. We’ll announce the (17) winners by Noon CDT on Wednesday, March 18th. So it’s time to get your blarney on and submit those articles – maybe you’ll have the luck of the Irish! Make it a bucket O’gold and gosh and begorrah, I’ll do it! Yeah. But I already have a mug. Drinking from it right now. Hi, I think the Mugs are a nice gesture. Mi name is Ana and I am the one in charge of submitting my husband’s articles (Steve Gillman). Today I will submit many of them hoping I can get that mug because St. Patrick’s Day is my birthday too. Being 1/2 Irish, I could use “half” a mug. and being 1/2 German, I could use “half” of a beer stein. But how do you drink beer from a coffee cup? or drink coffee from a beer stein? Let’s see here, Green St. Arbucks coffee! or a Green bran muffin? (let it sit out long enough and it will turn green on it’s own! Happy St. Paddy’s to all and may our blessed father of lights bless your socks off, and the rest o’ ya too. I won`t be anywhere near the number required, but a nice touch for those who will be able to reach the number required & win the mugs. Gotta get one of those mugs so i sat here and wrote and submitted for the past 9 hours..
Chris please don’t do this again…my brain is fried!! I sent one in just after midnight and was refused! I would have been writing all night had I known and been allowed to participate. Not sour grapes, just a point of fact. I was on a roll…but apparently there is the max that can be submitted if you’re a newbie! Darn, I had many more to submit. It appears you submitted all 10 articles of your Basic Membership. Somebody on our editorial staff is reviewing to see if we can help you out. Happy St. Patrick’s Day my new friend! I tried. I spilled coffee on my laptop this morning. UGH! I am a little late, but did turn in a couple of articles. I’m just running on Pacific time. Ha! Your mug will be sent to you in the next few days. If you didn’t make the cut this time, don’t despair. There will be plenty of other promotional give-aways in the upcoming months – some will be announced and others will be surprises. The best way to qualify is to keep submitting a constant stream of high-quality, fresh and original articles. Congrats to all the worthy winners. We should have included that stipulation in the rules. My apologies.